When Base Plant Projects realized Syncrude’s road building material was in short supply, they teamed with Mildred Lake Mining to seek a solution. 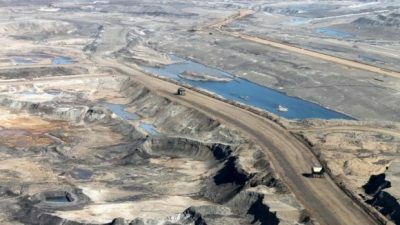 Did you know that the Alberta oil sands are the third-largest known source of crude oils in the world, next to Saudi Arabia and Venezuela? One of the largest producers of crude oil in Alberta is Syncrude. In 2011, Syncrude produced a considerable 105.3 million barrels of Crude Oil. Syncrude Canada Ltd. is one of the largest producers of crude oil from the oils sands in Canada. Based in Fort McMurray, Alberta, Canada, Syncrude’s current capacity allows them to supply 15% of Canada’s petroleum requirements. In 2011, Syncrude produced 105.3 million barrels of Syncrude Crude Oil. In 2009, Syncrude was faced with a challenge – the sand and gravel they used for road building purposes was in short supply. They had to find an alternate solution that was both cost and time-effective. In 2012, all haul roads in the North Mine will be built using EarthZyme®. About two to three kilometres of new haul road in the North Mine is built each year. Heavy hauler operators in the North Mine say that it performs better and is harder than conventional roads. EarthZyme® was able to provide the results Syncrude needed. Roads enforced with EarthZyme® were able to withstand constant flow of traffic from some of the world’s heaviest vehicles and trucks.